The black-legged kittiwake (Rissa tridactyla) belongs to the family of gulls and kittiwakes, Laridae. The black-legged kittiwake species is distributed in the North Pacific, North Atlantic and Arctic oceans and adjoining coasts. This kittiwake species nests exclusively on cliffs. These kittiwakes are polytypic species. The black-legged kittiwake (Rissa tridactyla) is a small gull, measuring 35 to 40 cm in length and weighing 300 to 500 grams. The wingspan is 90 to 100 cm. The adult black-legged kittiwakes have a marked seasonal variation in plumages. In all plumages, the outer primaries on upperwing and underwing are tipped blackish. The underwing is white. The black-legged kittiwake summer adults have white head with gray hind neck. The upperwing is dark gray, shading to whitish and ends in blackish tip. The back is gray. The bill is yellowish and the legs are blackish. The first year black-legged kittiwakes have a dark 'W' pattern across the wings and a blackish tail-band. In winter, they acquire a dark grey smudge behind the eye and a grey hind-neck collar. Their call is a nasal, wailing "kitt-i-waak..kitt-i-waak" sound. The black-legged kittiwake species are distributed in the North Pacific, North Atlantic and Arctic oceans and adjoining coasts. The breeding populations of these kittiwake species are distributed on islands off the northern coast of Russia, on the northern coast of Norway and along the coastlines of the north Pacific and Atlantic oceans. The black-legged kittiwake nominate subspecies R. t. tridactyla is distributed in North Atlantic Ocean and the adjoining coastal areas. The subspecies R. t. pollicaris is distributed in north Pacific Ocean and the adjoining coasts. In India, vagrant black-legged kittiwake was observed by Chinmay Rahane & Siddhesh Bramhankar on 24 November 2012, at Akshi in Alibag district, Maharashtra. Another vagrant black-legged kittiwake was reported by Sujan Chatterjee on 30 November 2012 from (Majuli Island) Assam. Suhas Kechery and Sandeep Das observed two black-legged kittiwakes in Chavakkad beach, Kerala, India on January 24th, 2013. Some of the Important Bird and Biodiversity Areas (IBA) of the black-legged kittiwake in USA are Unimak & Akutan Passes, Barren Islands Colonies, Barrow Canyon & Smith Bay, Buldir Island Colony, Ilnik Marine, Icy Cape Marine, Spitz Island Colony and Tuxedni Bay. The IBA of the black-legged kittiwake in Norway are Fuglefjella, Hopen island, Southeast Svalbard Nature Reserve, South Spitsbergen National Park, Sassen-Bünsow Land, Nordre Isfjorden, Jan Mayen island, Ingeborgfjellet, Northwest Spitsbergen National Park and Northeast Svalbard Nature Reserve. The IBA of the black-legged kittiwake in United Kingdom are Caithness Cliffs and Flamborough Head and Bempton Cliffs. Some of the IBA in Russia are Aniva bay, Verkhoturova Island, Talan Island, Rovnyy Island, Odyan bay, Nevskoye Lake, Navarin Cape and Iony Island. These black-legged kittiwake species do not normally occur in forest. They normally occur in altitudes from 0 to 100 meters. The artificial ecosystems of these species include coastal aquaculture farms and salt production facilities. 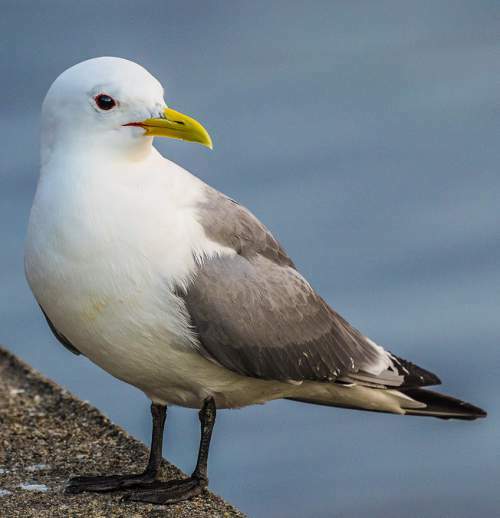 The natural ecosystems and habitats of these black-legged kittiwake species include, open seas, sea cliffs, rocky offshore islands, sandy, rocky shorelines, tide pools, coastal lakes, mud flats and shallow seas with emergent vegetation. The diet of black-legged kittiwake consists mainly of fish. Pelagic polychaete worms and larvae, small fish, squids and crustaceans are their primary food. Del Hoyo et al. 1996, had recorded earthworms, small mammals and plant matter as part of their diet. These kittiwake species mostly feed by plunge-diving from air, while flying upwind. They scarcely submerge into waters and most of the time pick their prey from the surface or from the top half-meter of the sea surface. The black-legged kittiwakes settle on the waters when the sea is calm and peck at and pick small organisms from the surface of the water. Sometimes, they submerge their head and catch their prey without diving. These kittiwakes are known to follow fishing vessels and feed on discarded under-sized fish. The also feed on offal thrown overboard during fish processing. In rare occasions they also pirate food from other sea birds (Del Hoyo et al. 1996). The breeding season of the black-legged kittiwake species is during May and June in most of their breeding range. These birds are monogamous and breed in large colonies. 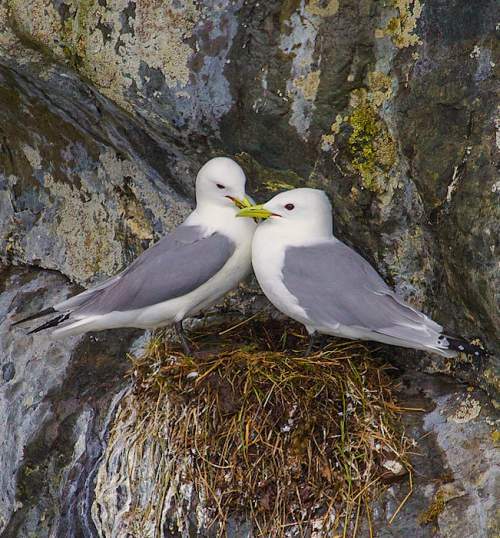 The pairing of black-legged kittiwakes occurs only at the nesting site. The nesting sites of black-legged kittiwake species are located on high, steep coastal cliffs with narrow ledges, in areas with easy access to freshwater (del Hoyo et al. 1996). In rare occasions they nest on glaciers, snow banks, buildings and piers. The black-legged kittiwake nest is a deep depression of mud, grass and feathers compacted by prolonged trampling. The typical clutch contains one or two buff colored eggs with blackish and dark brown spots. The black-legged kittiwake chicks do not have cryptical plumage. The young are fed with regurgitated food from throat. The young remain in the nest till they fledge. The young ones always take cliff-facing posture in the nest. These black-legged kittiwake species are mostly migratory birds. The breeding populations in coastal areas of north Atlantic, North Pacific and Arctic oceans move to open ocean after breeding in July and August. The wintering populations of kittiwakes make the return migration to the breeding grounds in February and March. The non-breeders may remain at the sea during the breeding season. The global population size of the black-legged kittiwake (Rissa tridactyla) is estimated to number about 14,600,000 to 15,700,000 individual birds. The overall population trend of the species is considered to be decreasing. Throughout its range, the black-legged kittiwake species is reported to be common to locally very common. The generation length is 12.9 years. Its distribution size is about 64,100,000 sq.km. Habitat alteration and destruction, climate changes, severe weather, over-exploitation of fish by humans, pollution and hunting are the main threats that are endangering the survival of this kittiwake species. The black-legged kittiwake (Rissa tridactyla) does not approach the thresholds for being Vulnerable either under the range size criterion, or under the population trend criterion or under the population size criterion. 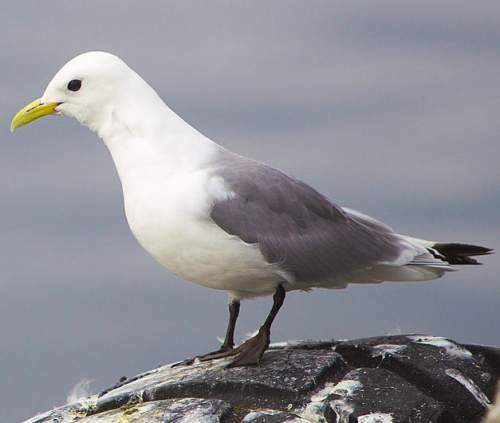 The IUCN (International Union for Conservation of Nature) has categorized and evaluated the kittiwake species and has listed it as of "Least Concern". The CITES (Convention on International Trade in Endangered Species of Wild Fauna and Flora) status is ‘Not Evaluated’ for black-legged kittiwake (Rissa tridactyla). The black-legged kittiwake (Rissa tridactyla) is placed in genus Larus by some authors. The two recognized subspecies of the black-legged kittiwake are: Atlantic kittiwake (Rissa tridactyla tridactyla, Linnaeus, 1758) and Pacific kittiwake, (Rissa tridactyla pollicaris Ridgway, 1884). Current topic in : Black-legged kittiwake - Rissa tridactyla.